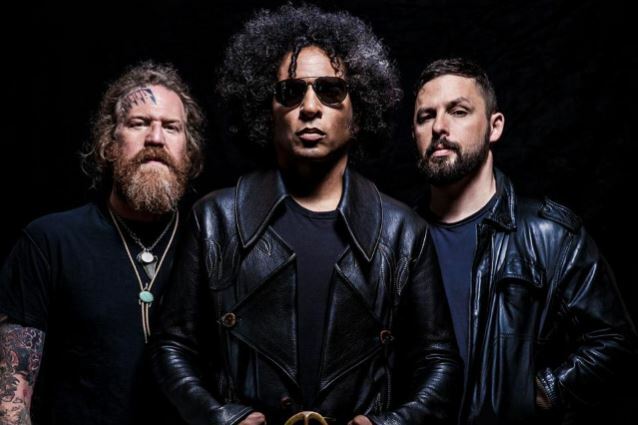 GIRAFFE TONGUE ORCHESTRA, the band featuring ALICE IN CHAINS singer William DuVall alongside members of MASTODON and THE DILLINGER ESCAPE PLAN, will embark on a short U.S. tour in late November. 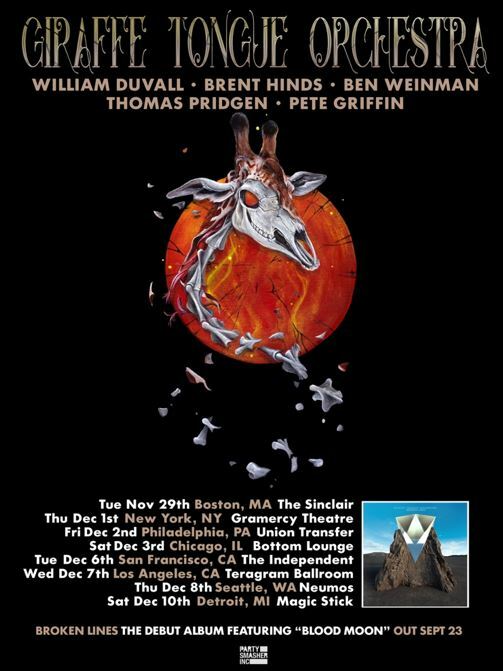 GIRAFFE TONGUE ORCHESTRA — whose lineup also includes Ben Weinman of THE DILLINGER ESCAPE PLAN, Brent Hinds of MASTODON, DETHKLOK bassist Pete Griffin and former THE MARS VOLTA drummer Thomas Prigden — made its live debut at this year's Reading (August 27) and Leeds (August 28) festivals in the United Kingdom. From adventurous progressive-metal epics like "Crucifixion", "Broken Lines" and "Fragments & Ashes" to pounding rock anthems like "Adapt Or Die" and "Back To The Light" (featuring a vocal cameo from actress and singer Juliette Lewis), to future crossover classics like the gorgeous power ballad "All We Have Is Now" and the electrifying made-for-radio dance-rock of "Everyone Gets Everything They Really Want", and the equally propulsive "Blood Moon", GIRAFFE TONGUE ORCHESTRA's debut album promises to be one of the most exciting releases of 2016. "Brent, William, and myself have all been friends for a long time," said Weinman. "Finishing the GTO record with William completes the puzzle. He is a man of diverse talents, and this band gives him the opportunity to spread his wings." Appearing on two tracks is QUEENS OF THE STONE AGE's Jon Theodore.